The 9th Korean Film Festival (KOFFIA) has hit Australian shores on August 9th in Sydney. They will be heading to major cities around Australia including Brisbane, Melbourne, and Canberra until September 23rd. In Melbourne, KOFFIA 2018 will take place from September 6th to 13th at ACMI, Australian Centre for the Moving Image. A huge range of Korean movies covering different genres from horror to romance will be screened. Many movies will be making their Australian premiere at KOFFIA 2018. 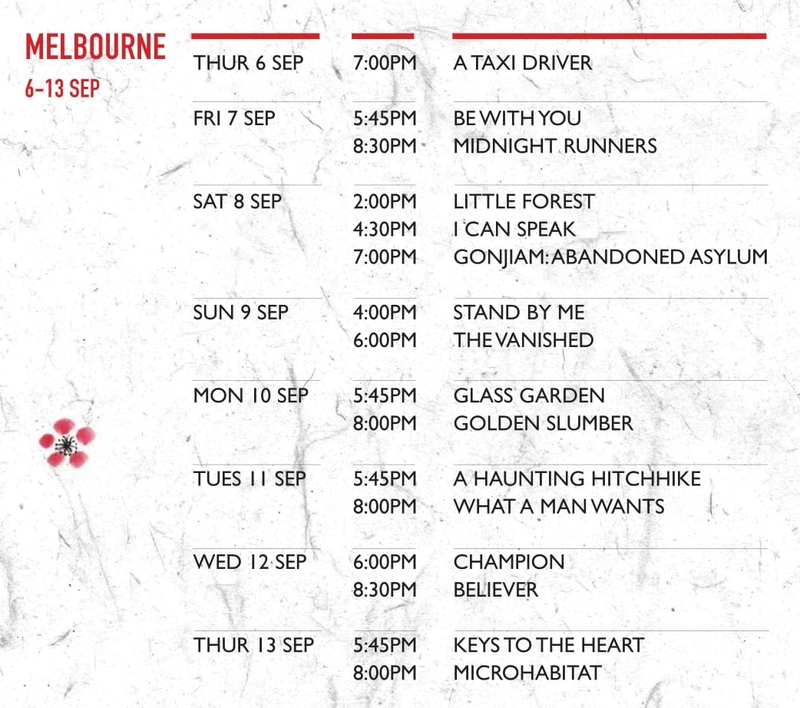 Check out the Melbourne schedule for KOFFIA below! All the information and details about the movies being screened at KOFFIA in Melbourne! Synopsis: May 1980, South Korea. Manseob is a taxi driver in Seoul who lives from hand to mouth, raising an 11-year-old daughter on his own after the recent death of his wife. After paying off his late wife’s hospital bills, all he has left in his possession is an old taxi that he treasures. One day, he overhears that there is a foreigner who will pay big money for a ride down to Gwangju city and back before curfew. Happy to be making big money to pay his overdue monthly rent, Man-sub snatches the job, not knowing that the foreigner is a German journalist with a hidden agenda. They arrive to find a city under siege by the military government, with the citizens, led by a determined group of college students, rising up to demand freedom. What began as an easy fare becomes a life-or-death struggle in the midst of the Gwangju Uprising, a critical event in modern South Korea. Synopsis: Woo-jin and his son Ji-ho, struggle to cope with the loss of the mum of the family, Soo-ah. Woo-jin is heartbroken and concerned over his son, who truly believes that his mother will return in the rainy season just like in his favourite fairy tale. In a midsummer day’s miracle, however, Soo-ah returns, but with no recollection of who her husband and son are. Whilst rebuilding their memories, they await what will happen with the imminent approach for the end of the rainy season. Synopsis: At Seoul’s prestigious Police University, slow-witted jock Gi-jun and shy bookworm Hee-yeol become best buddies through their tough training. On a rare night out, they witness the abduction of a young woman. Turning to the authorities for support, their pleas fall on deaf ears as the police are preoccupied with a high-profile kidnapping case. Gi-jun and Hee-yeol are called to action and must become a formidable crime-fighting force having no alternative but to investigate the abduction themselves. This leads to a night of comedic hijinks and shocking revelations as they learn to apply both their deductive and combat training in the real world. Synopsis: No job, bad romance and terrible grades… Nothing goes smoothly in young Hye-won’s life in the big city. She puts her unsolved matters behind and impulsively returns to her country hometown, to the house where her mother left her when she was 18. There she reunites with her childhood friends Jae-ha and Eun-sook who are living rural lives in their own ways. Hye-won’s days are filled with simple but peaceful moments as she prepares meals with her organic ingredients. Throughout four seasons Hye-won slowly finds the real pleasure in living the simple life, and realizes the genuine reason that led her back to her homeland. Synopsis: Min-jae, a fastidious young civil servant, takes on a new post, eager to impress in his new district while he takes care of his younger brother at home. Little does he expect that he will end up locking horns with the elderly Ok-boon, known as the ‘goblin granny’ she terrorizes the office with innumerable complaints on a daily basis. However, before the rivalry gets the best of either of them, Ok-boon discovers that Min-jae is a great English speaker, and since she desperately wishes to reconnect with her long-lost brother in America, she makes him a proposition: a moratorium on abusing the office’s resources in exchange for English lessons. Before long the two grow close until some long-buried secrets make a very public return to the surface. Synopsis: After seeing the news of two teenage boys that have gone missing after exploring Gonjiam Psychiatric Hospital, Ha-joon, owner of YouTube channel ‘Horror Times’ decides to explore the building as well. Recruiting a group of volunteers they venture into the notorious psychiatric hospital, dubbed one of ‘the seven freakiest places on Earth’. Shut down in the 1970s, following an alleged mass suicide of its patients, the asylum is rumoured to have housed political prisoners as well as the mentally ill, who were tortured and tested on by the director, who has since disappeared. Each team member is fitted with a camera rig that films both them and their point of view, while team captain Ha-joon guides them remotely through the abandoned corridors from a tent in the woods outside. What the volunteers don’t know is that, in an effort to boost online views, Ha-joon and his colleagues are leading them into a hoax. But the scares soon veer off script, suggesting that legitimate supernatural forces are at work. Synopsis: Deok-gu, a 7 year old boy, lives with his little sister Deok-hee and his grandfather in a country village. A few years ago, Deok-gu’s father passed away in a traffic accident, and soon after, his mother ran away with her father’s life insurance payout. Working part-time just in order to survive, the grandfather struggles to raise the kids, and it’s not easy to buy even a small toy for Deok-gu. While Deok-gu prepares to enter elementary school, his grandfather discovers that he doesn’t have much time left. Knowing that Deok-gu is too young to look after himself and his sister his grandfather prepares a present for his grandchildren that may be his last. Synopsis: On a dark and stormy night, a watchman on late shift at Korea’s National Forensics Laboratory discovers that a body has up and vanished from the morgue, after chasing him around. The police sent to investigate the matter are led by Detective Woo, who seems to have a haunted past himself. The missing body is that of Yoon-seol, a powerful and wealthy businesswoman who died of a heart attack. Detective Woo’s attention is immediately piqued by the woman’s widower, the much younger, handsome Jin-han. It seems Jin-han, a bio-med researcher whose work was never taken seriously by the domineering Yoon-seol, was a trophy husband. Unfolding over the course of one night, predominantly in one location, The Vanished channels the spirit of Alfred Hitchcock and a dash of Euro noir for a psychological thriller that delivers. Synopsis: Despite her disabled leg, Ph.D. student Jae-yeon is a brilliant researcher with a rare ability to communicate with nature. Having been hurt by her hypocrite colleague and lover, she turns her back to the world and goes deep into the forest to live alone in a glass garden. Meanwhile, novelist Ji-hoon develops a fascination for Jae-yeon and, despite her cold reception, begins to hover around her. Inspired by her, he eventually writes a novel about her titled ‘The Glass Garden’. Jae-yeon slowly begins to open up to him. However, he realizes that something mysterious is happening in the glass garden and, shocked and confused, makes a crucial mistake from which there will be no return. Synopsis: Gun-woo is your average, model-citizen. He’s become quite the local celebrity after saving the life of a top class K-pop star and enjoys his days working as a courier delivering packages in the bustling city of Seoul. This peaceful life is turned upside down when he witnesses the assassination of a presidential candidate in a bombing incident. There’s a conspiracy afoot however, as all the evidence, security-camera footage, witness testimonies and even fingerprints, point to Gun-woo as the culprit. After necessitating a breathless dash from harm’s way on his part to avoid incarceration, all Gun-woo can confide in is Mr. Min a friend of a friend who does his hardest to clear Gun-woo’s name from this conspiracy. As time passes, the incident spreads its reach across others close to Gun-woo and it appears that the mastermind behind it all has a personal score to settle against him. Synopsis: Sixteen year-old Jeong-ae lives with her father in an area being redeveloped in Seoul. Her father was diagnosed with an end-stage cancer but refuses treatment as he has given up all hope in living and awaits his death. One day, Jeong-ae receives a letter from her mother, who left home a long time ago. Thinking that it is her only hope left Jeong-ae leaves in search of a mother she has never seen aided by her friend Hyo-jeong who also shares a goal in finding her biological father. Although their first attempt ends abruptly through unforeseen circumstances, Jeong-ae meets a man she suspects may be Hyo-jeong’s father. Synopsis: Seok-gun, an ex-rollercoaster designer turned taxi driver loves his wife Dam-deok but he also loves playing with fire on secret nights out. But Dam-deok’s sudden death leaves Seok-geun miserable and heartbroken realising that she was the true love for him. Bong-soo is the boring and prude husband of Seok-geun’s sister, Mi-young. His Italian restaurant business seems lacklustre, and so is his marriage, until he meets Jenny, who later ends up getting a job at his restaurant. Fond of Jenny’s personality and good sense of humour, Mi-young decides to hire Jenny as housekeeper for her brother, Seok-geun to liven up his house. How well will these four people get along with each other until something blows up? Synopsis: Mark, a Korean former arm-wrestling champion raised in the U.S. now makes his living as a bouncer in bars and as a security guard in big-box stores. Lonely and unfulfilled, he takes up the offer of his old friend Jin-ki to return to his native country and resume his sports career. To add to the incentive of returning home, Jin-ki promises to provide the address of Mark’s long-lost mother who gave him up for adoption. Upon arriving in Korea, Mark heads to the address only to discover that his mother died years earlier. But he does come into contact with a family he never knew he had, a widowed half-sister with her son and daughter. Coming to terms with his roots he must make a name for himself as he aims to become the number one arm wrestler back in his motherland. Synopsis: Won-ho, a troubled and obsessive head detective of Seoul’s narcotics squad is hell-bent on arresting the elusive Mr.Lee, the boss of the biggest drug cartel in Asia. He hits the lowest point in his 2 year investigation when Soo-jung, his teenage girl mole in the cartel is murdered by Mr.Lee’s men. Just when the investigation is about to be called off, an explosion at a Seoul drug lab which wipes out most of Lee’s higher-ups comes in as a stroke of luck as one of the survivors, Rak, low-level member of Lee’s organisation decides to aid Won-ho in capturing Lee. What begins is an exhilarating crime thriller edgy in its spiral toward an explosive conclusion. Synopsis: A washed-up boxer, Jo-ha, has lived his life relying on nothing but his physical strength. His glory days were short lived and the previous welterweight champion makes ends meet by sparring other boxers and by distributing flyers on the streets. Soon after he is fired from his latest gig, he runs into his mother In-sook, who left him and his violent father while he was still an early teen. Eager for a free place to crash, Jo-ha puts aside the resentment and grudge toward his ageing mother and accepts her offer to stay in her home until he can get back on his feet. There, he meets his autistic half-brother Jin-tae, whom he didn’t know existed. Synopsis: Miso is a 31-year-old housekeeper who lives strategically on a small budget but leaves enough aside for her life’s three greatest pleasures: whisky, cigarettes, and her boyfriend Han-sol. When New Year’s Day brings about an across-the-board price hike on cigarettes, rather than cut back on the habit, she gives up having a roof over her head and begins to surf through the couches of her old college friends, each of whom has their particular circumstances that don’t allow her to stick around for long. Which movie are you most excited to watch at KOFFIA? Let us know in the comments below! Keep following Officially Kmusic for more music, event and news updates!